Sumayal Shrestha has planned out her part in trying to prevent the human race from going the way of the dinosaurs, Romans and other extinct civilizations and cultures. The 24-year-old native of Nepal plans to return home after graduation next spring, where she said there is a great need for knowledge in the use and preservation of the developing country’s rich biodiversity and natural resources. She and Suzanne Edmunds of Bolton, an undergraduate in environmental science and policy at Clark, will exhibit work they’ve done at the second annual Massachusetts Green Careers Conference from 7 a.m. to 12:30 p.m. Friday at the Holiday Inn in Marlboro. Ms. Edmunds’ work focuses on recycling. Ms. Shrestha’s is an analysis of solar and energy suitability in Stow, using geographic information system mapping tools. It was a project that she and other students in Assistant Professor Will O’Brien’s Green Business Management course did last spring for Stow Energy Group. The theme of the conference is “Find Your Role in the New Green Economy.” As happened last year, hundreds of people throughout New England are expected to attend. Forty experts will be available to provide information about the green economy and related training and careers. Several area colleges will have information on their environmental, energy and sustainability programs established to help meet workforce demands. This year, businesses will be accepting résumés for several jobs, including marketing, sales, customer service, energy efficiency, weatherization and technical support. The host of the conference is Green Workforce Training and Associates, founded by Jen Boudrie of Marlboro, an instruction designer for the past 20 years and leader of a local environmental group called Green Marlboro. Ms. Boudrie said she created the annual conference because so many people are eager to learn about and transition into green careers. “I think some people will find jobs. Some people will find training. Some people will find inspiration. Some people will find a bigger network. And some will find knowledge they need,” she said. People can get more information and register for the conference at www.massgreencareers.com. Tickets may be available at the door. The conference sold out five days in advance last year. The future of diverse green careers in Massachusetts is very bright. The state is on the forefront when it comes to legislation, incentives, investments, innovation resources and job creation. Massachusetts ranks second, behind California , in the top 10 leading clean-energy states, according to a study by the state Clean Energy Center commissioned earlier this year. The states were compared in 56 categories encompassing regulatory and financial incentives, knowledge capital and economic and workforce development. Ms. Fitzgerald said the problem faced by the green industry in this country is a lack of national policy. There are state strategies, but companies such as Evergreen are leaving for China and other countries that have national policies to provide free land, tax breaks and support for their research and development. She said the U.S. Senate should take the U.S. House’s lead and pass energy and climate legislation. “We’ve got a policy gap. We’re starting some companies, but we’re not keeping the manufacturing jobs. Given the rate of unemployment, we need to have those manufacturing jobs located in the U.S.,” she said. U.S. Sen. John F. Kerry, D-Mass., said he was optimistic regarding the fate of climate legislation. “The work we’ve done over the past two years will remain the foundation for passing climate change. We’ve built an unprecedented coalition of support and I’m convinced President Obama, Majority Leader (Harry) Reid, and the overwhelming majority of the Democratic caucus want to continue this fight and win. They know climate legislation will create millions of American jobs, strengthen national security, and give us cleaner air. I can’t tell you that it’ll be next year, but we’ll get there because the issue gets more urgent every year. I know we can get there,” Mr. Kerry said. Clean energy was the No. 10 industry in the state in 2007, according to a study by the Massachusetts Technology Collaborative and the former Renewable Energy Trust. A study released by The Pew Charitable Trust last year shows that between 1998 and 2007, Massachusetts was among only seven states in which total jobs decreased but clean energy jobs increased. The Pew study also determined that Massachusetts ranked sixth among states in clean technology patents, with 384 from 1999 through 2008; and second in clean technology venture capital funding, with nearly $1.3 billion in private investment from 2006 through 2008. She said that even during the global recession, the clean energy market has grown 230 percent over the last five years. While the U.S. remains the leader in clean energy innovation, the country has fallen behind when it comes to financial investment, primarily because of not having federal legislation. Green jobs are “the future,” but much of the work involves occupations that have been around for some time, a panel of experts said yesterday. Speaking to a crowd of hundreds at the second Massachusetts Green Career Conference, author and Northeastern professor Joan Fitzgerald pointed to jobs in plumbing, electrical and carpentry. “A lot of it is the same occupations we’ve always had, being applied to green sectors,” Fitzgerald said at the Holiday Inn. The sold-out conference brought together businesses, schools, experts, students, state workers and job seekers for a day that included informational sessions, exhibits and networking. When conference director Jennifer Boudrie polled the crowd about reasons for attending, many people indicated they were thinking about changing careers. “Green jobs can be created anywhere,” Fitzgerald said. The panelists pointed to a need for engineers. Panelists stressed the importance of green jobs. Doyle said he was upset about the recession’s effect but said he realized green companies are in it for the long haul. “This is a great time to be talking and researching green jobs,” even though it’s not an ideal time to look for work, Doyle said. Doyle advised job-seekers to “push through the system” and apply for any jobs they feel they could do, even if they call for an overwhelming amount of experience. The growth has been smaller than hoped so far, Doyle said. “Future economic development … will rely on green careers,” said Mark Sylvia, director of the green communities division in the state Energy Resources Department. Wind and battery manufacturing have grown in the United States, said David Hess, a professor at Rensselaer Polytechnic Institute. “Manufacturing is a key part of the green economy,” Fitzgerald said. Andrea Perrault, program developer for work force development at the state Education Department, said she liked the quality of the speakers. “It’s really old jobs being retrofitted for the new economy,” Perrault said following the panel discussion. According to Conference Director Jen Boudrie, the Massachusetts Green Career Conference sold out in advance for the second year in a row. The conference was held earlier this month at the Marlborough Holiday Inn. Altogether 350 people came to learn about the green economy and careers. Most of the attendees were stakeholders from colleges and high schools who attended to learn about green career options for their students. Other stakeholders were from businesses and government, while about one quarter of the attendees were people seeking career transitions and new jobs. The conference offered a mix of lectures, coaching, exhibits and workshops. 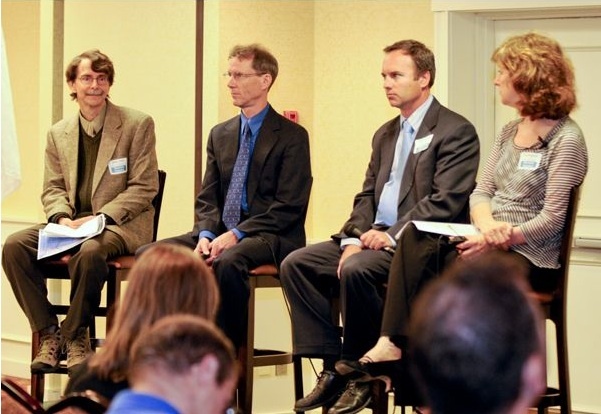 Four leading experts on the green economy and green careers participated on the keynote panel. Six green career coaches met with 40 people for one-on-one sessions. A total of 34 exhibits included businesses accepting resumes, colleges and professional career resources. 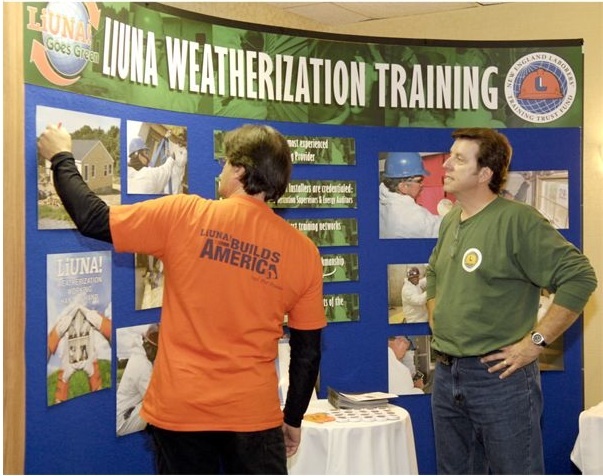 More than 30 experts hosted sessions on such topics as green careers, education/training, and business. The two most popular sessions were “The Green Economy and Careers in Massachusetts ” and “Green Career Transitions and Pathways” which were attended by 120 and 150 people respectively. Boudrie said a conference will be held in Marlborough again next year, and she expects it to be even bigger. “The green economy and green careers will continue to grow and expand, and we will keep people up to date with our experts and exhibitors,” she said. “I have designed this conference to be informative and practical, with a little fun thrown in, so people get a lot out of it and enjoy it.” For more information, visit www.MassGreenCareers.com. PHOTO: Keynote panel with four experts kicked off the conference with a discussion about green careers. The panel included (l-r) David Hess, professor in Rensselaer’s Department of Science and Technology Studies and author of the Green Jobs Project about state and local government policies in the U.S; Kevin Doyle, principal of Green Economy and Workforce Development co-chair at the New England Clean Energy Council; Patrick Cloney, executive director of the Massachusetts Clean Energy Center which is accelerating the growth of the clean energy industry in Massachusetts through direct investments in businesses and workforce development; and Joan Fitzgerald, author of Emerald Cities: Urban Sustainability and Economic Development, and professor/director at Northeastern University. PHOTO: New England Laborers Union representatives are John Phillips and Kevin Farias at one of the 34 conference exhibits. Photos by Matt Baldelli.